Digital cameras are everywhere. Even cell phones can be used to snap photos. The side effect of this amazing technology is we don’t have the chance to display the photos – each and every one of them. 1)	Too lazy to send them for printing. 2)	Don’t know which pictures to print. I have hundreds of them, if not thousands. To be fair, even though we’d have printed them all, where do we hang them? Our little house has definitely insufficient space. Never mind about the costs. Worry not, there’s a solution. We can solve this by using one of the many digital photo frames. You upload a collection of digital photos to the memory of the digital photo frame. The pictures are displayed automatically and changed based on a time interval set by you. Isn’t that cool? Now you can display all your photos with just one photo frame. A quick check at Amazon.com reveals that the price range is from $70 to $200. Sounds expensive but this seems like a more practical solution. 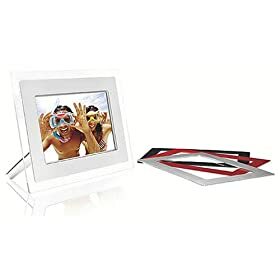 Not only that, digital photo frame makes a perfect gift too.